draped in monastic robes falling in widely spaced sweeping folds from the left shoulder, the mantle secured by a triangular clasp hanging from a knotted cord threaded through a ring on a square plaque high on the back, the cloth gathered by the clasp into a pleated fan shape and falling over the left arm, the arms held close to the body, the right arm held slightly higher, broken off at the elbow, the left arm with truncated wrist turning down, the body very simply modelled with slightly protruding stomach in front but flattened on the back, with robes falling straight down to the ankles, the surface of the white marble showing extensive remains of original red and green pigment painted in squares to indicate a ‘patchwork’ fabric and detailed in black, and with tiny traces of gold leaf, the bare feet resting on a circular plinth with tapered sides, broken off at the end and now socketed into a block-form bronze-veneered base. Compare the larger marble torso carved in a very similar style, in the collection of the Museum of Far Eastern Antiquities, Stockholm, illustrated by Siren in a monograph entitled “Chinese Marble Sculptures of the Transition Period” published in the Bulletin of the Museum of Far Eastern Antiquities, Stockholm, 1940, no. 12, pl. VIIIa, and referred to in the text on p. 491. 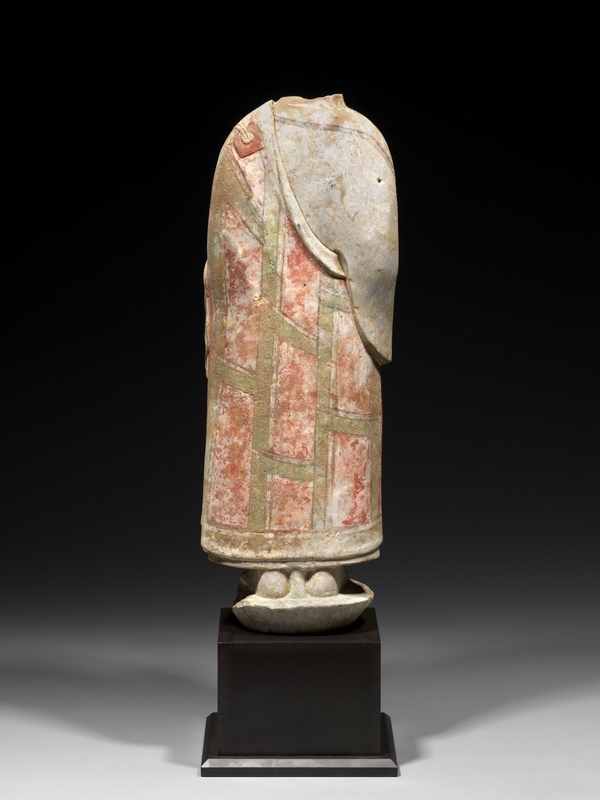 The “Transition Period” in the evolution of Chinese sculptural style is defined by Siren as a developmental period which “…coincided approximately with the reigns of the Northern Ch’i and Northern Chou as well as the Sui (c. 560-618), but its particular style did not find full expression until the beginning of the 570ies, and its best and most significant creations were produced within little more than a decade, i.e. before 585”. 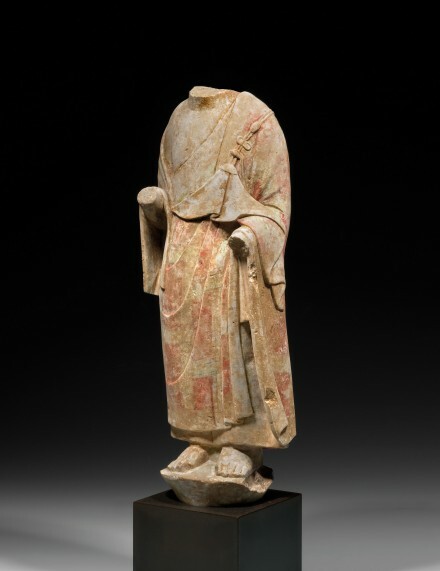 Compare the larger Northern Qi period painted limestone torso of the Buddha shown standing in a similar pose with right hand missing but with the wrist turned up indicating the hand was probably in the abhaya mudra, and with the left hand lowered in varada mudra, wearing robes gathered into pleated fan-shaped folds over the left shoulder and similarly painted in a ‘patchwork’ pattern, unearthed at the site of Longxing temple in Qingzhou, Shandong province in 1996, illustrated in the catalogue of the special exhibition Return of the Buddha: The Qingzhou Discoveries, London, 2002, pp. 108-109, no. 15.